134 people lost their lives!! Very active monsoon season was seen during the last one week in Pakistan especially in Sindh province which has received much rainfall than any part of Pakistan this monsoon season. Upper parts of Pakistan mainly saw isolated to scattered rainfall activity. Temperatures remained low due to enhance monsoon activity while humidity remained high. Severe destruction has occurred in Sindh province due to 2nd and 5th monsoon spell. *Feeble western trough over Gilgit region, moving to Indian-held Kashmir. *Low pressure over north-western Sindh and adjoining south-west Rajasthan. *Low pressure at 998 mbar over Jharkhand, India. Isolated to scattered thunder/rainfall may occur at few places of upper Pakistan in 48 hours, while the 5th monsoon spell has ended in Sindh, however there are chances of few isolated rain/showers in some upper and eastern parts of the province till 24 to 36 hours. Monsoon is likely to continue till September 15 in Pakistan, beyond that the future of the monsoon is uncertain, however there are some indications that monsoon may continue till the end of the month at least in upper Pakistan. More over monsoon rainfall has been in Sindh at least 180% above than its normal, leaving the wettest areas of Punjab, Khyber and Kashmir far behind. Pakistan Weather Portal (PWP) successes fully predicted the 1st, 2nd, 3rd, 4th and 5th monsoon spell in Sindh. 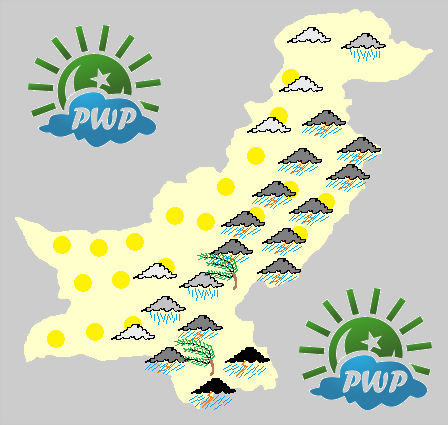 PWP on September 5 in its Monsoon of Pakistan page, forecasted about the possible 6th monsoon spell hitting Sindh. On September 9, PWP upgrades that forecast to “extremely high” for the 6th monsoon spell. This spell hit some parts of Sindh on September 10, other parts will be hit by September 11. *The low pressure over north-west Jharkhand is very likely to move westwards, as said by PWP on September 5. This low pressure will reach central India (Madya Pradesh) on September 11 and send fresh monsoon moisture to south-eastern Sindh on September 10/11, this system may enter Sindh on September 12/13 as of September 10. *This spell may resemble the 2nd monsoon spell, but as of September 10 it is likely to be slightly week and small in duration than the 5th spell. Thunder/Rainfall may occur in 24 to 48 hours in the capital after that the weather is expected to calm down a bit and from September 11/September 12, monsoon winds will shift to upper parts of Pakistan and then Thunder/rainfall is expected, it will be light to moderate intensity and continue till few days with few gaps . 32 °C to 34 °C in Islamabad. In Northern Punjab: Lahore, Faisalabad, Murree, Rawalpindi, Sargodha, Sialkot and other adjoining cities. Rainfall with scattered moderate falls expected to continue till few days with few gaps, the monsoon flow from Sindh could reach north Punjab on September 12. Rain will be accompanied by thunder and fast winds. 33°C to 38 °C in Faisalabad. In Southern Punjab: Bahawalpur, Multan, Rahim Yar Khan, D. G. Khan and other adjoining cities. Rainfall will be moderate falls expected to continue till few days, the monsoon flow from Sindh could reach south Punjab on September 11 night. Rain will be accompanied by thunder and fast winds. 34 °C to 37 °C in Bahawalpur. In Upper Sindh: Sukkur, Larkana, Jacobabad, Kashmore, Nawabshah and other adjoining cities. The fresh monsoon winds will enter from September 11 and continue till 2 to 3 days, mainly till September 14. Rain will be accompanied by winds and thunder, it will be moderate in intensity with chances of isolated heavy falls. 33 °C to 37 °C in Sukkur. 35 °C to 37 °C in Nawabshah. In South-eastern Sindh: Mirpur khas, Umerkot, Tharparkar, Badin and Hyderabad. The rainfall could occur from September 11 till September 13 during this period heavy rainfall may occur in Eastern Sindh and till September 14. Rain will be accompanied by fast winds and thunder, it will be mostly heavy in intensity with chances of scattered heavy falls in some eastern parts. In coastal Sindh: Karachi, Thatta, Keti, Shah Bandar and other coastal localities. The 6th spell has reached some parts of Sindh on September 10. Rain will be accompanied by fast winds and thunder, it will be moderate in intensity in Karachi with chances of isolated heavy falls while chances of isolated to scattered heavy rainfall in Keti Bandar and Thatta. Chances of rainfall will persist will September 14, then a decrease is expected. This monsoon activity will continue till September 14 with peak intensity, after that the intensity will decrease. Monsoon may start to withdraw from some parts of the country. At least 347 people have died in Pakistan since June 25 due to heavy rainfall, wind storm, heat waves, floods and other weather-related incidents. 134 people died in Sindh during the 11-day stormy rainfall in Sindh. ← Tropical Madness in the Atlantic and Pacific! yeah good rain since morning.. but what lies ahead for Karachi??? Accuweather is showing chnaces of local flooding in Karachi…… Kya bolte hoo sab??? 2nd wave is in developing stage ? How much rain? Is it really raining for 16hours as people are suggesting…whether moderate or heavy? and is it still raining in any part of the city? Yeah ! Moderate rain here at Safurah. yeah light to moderate rain for more than 14 hours.. it became quite heavy again half an hour ago for 10 minutes and now again it is light to moderate..
its still raining here at University road with moderaate to light intesity though. SHould we expect some heavy spells today?? what do you people say? whats ur read of this situation?? KM come on mate! we need updates. in the end i have seen very heavy rain,should be the best rain of the year specially the one at midnight.now i am satisfied.my area got 105 mm at the moment. Why my comments are not appearing? I have been commenting for hours and i can’t see any of my comments…weird. Guys, please update about the amount of rain. Is it still continuing? Did the rain stopped for sometime or is it really really non-stop? Is it still raining in any part of the city? yaaar km no thunderstorm in sindh present?……. no heavy rain now…..
it will dry out till late evening. Mirpurkhas city finaly 100% doob chuka hai.ab aagay kexa weather rahy ga??? Walaikum assalam Wasi – There are still chances of rainfall in Mirpur Khas till September 14 morning, after that a significant decrease expected in the level of moisture..
only 9 m0nths left for the next monsoon. monsoon 2011 ends in karachi in a great way. Yeah ! Lots of sunshine for Karachi ahead and lots of m0nths to wait for the next monsoon. Well i was expecting some showers today but it tutns out nothing is in store for Karachi…140mm is more than enough for Karachites for a year :). any other type of cyclone or rain expected in karachi…!!! will there be rain from la-lina….!!!! or will there be dry season from now onwards…!!! Rply quicK… wht about showers today…! !will there be rain ! Well, this is the last day of monsoon for sure. Heavy clouds c0ming here from NE. Heavy rain lasted for 15 minutes ! Rain lasted for 30 minutes. The blog was was doing just fine before the monsoon season.. Thank You SAK very much and your kindness will be remembered. Karachi Metro ! Whats condition of Upper Sindh LARKANA Division ? now when will rain again come to larkana nearly ? slim chances of isolated showers/drizzle till September 18 morning, after that monsoon activity all over Pak expected to weaken..
@ K.M, From two days blazing sunshine over karachi and very hot weather.why? Babar bhai sindh m khas kar k South-eastern Sindh m septembar m koi our spell aany kay chances hein ya nahi??? la nina update plz ?????????? what a turn around in this monsoon season,in the end of july 2011 we were comparing this with monsoon 2008 or worst and only 7 mm of rain was occured but in the end it gave above normal rains for karachi.